Verona is a popular tourist destination in the Veneto Region of Italy, on the Milano-Venice train line, 70 miles west of Venice. There is a small airport just outside of Verona. (Locate Verona on a map of the Veneto.) Lake Garda is nearby. Other nearby towns worth a visit are Cremona, Brescia, and Vincenza. Arena di Verona: A 2000-year-old Roman Arena and it's still going strong. The opera stage is the largest in the world. In the summer months, the arena hosts opera and other performances. Make sure you get tickets early. A good source of tickets and a performance calendar is found on Select Italy's Arena de Verona (book tickets direct with Select Italy). 2 Bridges (ponti): Visit the Ponte Scaligero for a beautiful view, and the Ponte Pietra, a Roman-era bridge over the Adige river. 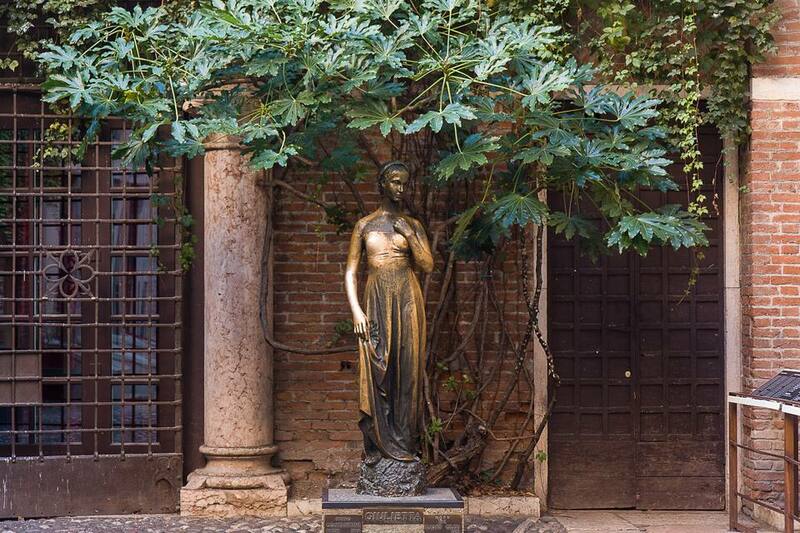 Juliet's House (Casa de Giulietta): Ok, we're not even sure that Shakespeare ever visited and the characters come from a story by Luigi da Porto of Vicenza but hey, you can rub the right breast of Juliet's statue for luck and take a picture of the balcony like everybody else, eh? Piazza dei Signori: A central square including a statue of Dante because he resided in Verona for a while. Piazza Delle Erbe: It used to be the Roman Forum but now it's a wonderful open-air market surrounded by historic buildings with frescoes and peppered with sculptures. Go here for a cheap meal. And if you desire to see Verona from above, head up the Lamberti tower to get 84 meters above Verona. Castelvecchio (the Old Castle): Beautiful Views and an interesting art collection inside. For those who prefer traditional hotel lodging, The four-star Hotel Accademia occupies a prime location between the Piazza Bra (where the Arena is located) and Piazza Delle Erbe, the cities marketplace, along with the Via Mazzini, the central shopping boulevard. If you are coming to Verona via rail, the three-star Hotel Verona gets excellent reviews. Remember that lodging may be a little difficult during prime performances at the arena, so book ahead if you know the dates of your travel to Verona. For families, groups of friends, or for those who'd enjoy taking part in the life of the Veronese, a vacation rental house or apartment might be a better choice, especially if you're planning a stay of a week or more. HomeAway lists some very interesting properties, including some in Juliet's Courtyard and one inside a 15th-century castle tower. Over 60 budget hotels and hostels are listed at HostelWorld. Eating in this part of Italy can often involve polenta, horse and donkey meat, Pasta e Fasoi: pasta and beans, and stockfish (a dried, salted fish like salt cod).